That makes perfect sense. But...I LOVE using my big, round, wooden spoon with the thick, long handle. Every flat wooden spoon I've seen has a flat handle. I tore the ligaments in my dominant wrist years ago and I can't even get a secure grip on skinny handles. So I agree, John. It just doesn't feel right. Wooden spoons are great for tasting. They absorb heat very rapidly and I'm sure have saved me from many a burnt mouth when tasting molten hot cheese sauces and the like. Also, if it has squared off edges and is more or less flat, then it is not a spoon. That's the most ridiculous, pointless rant I've heard of late. Perhaps Mr. Ruhlman, like myself, was paddled with a wooden spoon when he was younger and came to hate the instrument of his discipline. I, on the other hand, embraced the wooden spoon knowing it's not wooden spoons that paddle people, but people that paddle people. The wooden spoon has a number of functional uses that a squared spoon doesn't. First, it's easy to impart a deep cupped shape which mixes thicker fluids more effectively and, second, it's end-shape lends itself to getting into the rounded bends of sauce pots where a squared off end would make things more difficult. Yes, a squared off spoon is more efficient for scraping the flat bottom of a sauce pan, but why can't you (insert dramatic music) USE BOTH!!! Novel idea, I'm sure. I am 51 and I still have and use the wooden spoon my Mother used when I was a little boy....Come on Ruhlman say something about cast Iron...Bring it! Well, he's right. >ducks< I have an entire set of well-aged wooden spoons, including two of the MOST useless: one with a cracked bowl, and a freakishly tiny one. And yet, they are my favourite. The freakishly tiny one comes in handy shockingly frequently! BUT! When I'm making risotto in my wide, flat-bottomed, high-sided pan, I use a wooden implement that can only be described as a paddle. It has a squared bottom. It has a rounded handle just like a wooden spoon. It is slightly curved, but has no scoop. It gently moves the rice around the pan, coaxing every bit of silkiness off the bottom of the pan and back onto the rice. But the spoons, which were my grandmother's and mother's, will always be #1 in my heart. Even if Ruhlman is right. Couldn't agree more Chef John! As a visual artist, to me it's not the tool that is more efficient that makes your work, it's you, and what you can do with "bricks"... not that the flat wooden spatula isn't great, I have one. But when I look at my round wooden spoon, I think of all the kitchens in my lifetime that have had them, and I feel comforted to have one in my own. No offense to MR, it was a funny video, but he's wrong. I think wooden spoons are only bad for tasting when they are new. Once they are nice and smooth and old they are fantastic. That said, I have the bad habit of leaving my spoon across the pot and the heat weakens the handle (and leaves burn marks) - so my oldest spoon recently snapped in two. I was devastated! "Wooden spoons are great for tasting. They absorb heat very rapidly and I'm sure have saved me from many a burnt mouth"
I think you mean wood doesn't absorb (conduct) heat rapidly. I just counted 13 wooden spoons standing proud in my "ready jar" right next to my stove; more in the drawers I'm sure and I have two spoons more than 100 years old. Four of them have flat edges, the remainder are round. I've been cooking for much longer than michael ruhlman has been around and these spoons have served me well. I'm pretty sure I know which tool to use for scraping the bottom of a pan. Furthermore, not every pan needs scraping. Hint to Mr. michael ruhlman: If you want me to take your rant seriously, use upper case for the first letter of your names. I can recognize stupid tools but I can also recognize "cutsy-pootsy" when I see it. Like a few others, I met the back of the spoon a few times...probably because my mom had one in her hand at all times. That didn't scare me. Some of my best memories involve a bubbling jam, beans or stew being successfully stirred with well seasoned wooden spoon. When I went to culinary school the pastry teacher broke us into groups to make pate choux. I told my group to use a wooden spoon, because the person who taught me said always use one. Ours was the only ones that came out. Since I don't want to waste eggs and butter with a failed attempt, I always use a wooden spoon. Everyone has to take a stand for what they believe in at some point in their life no matter if its a "big" issue or not. That's what gives life meaning ... Imho. Exactly my thoughts the moment I read Ruhlman's post! The passion he puts in belittling the poor wooden spoon is worth a better cause. My grandmother taught me that metal spoons are a no-no, so how do you taste your food? I have one of those squared off spoons and love it. It's great for scraping bits off the bottom of a pan. And yes, a wooden spoon is great for taking a taste. However I only have the one wooden spoon. For tasting I keep a tablespoon handy. Not only round, but a different round for different tasks. I have a flattish, almost paddle like, short handle spoon I use for thick stews and dog food making. There is the long handled one for making huge pots of stock and soup. There's one with a pointy edge for gravies, the red stained one I always reach for when making tomato gravy, one with a crack I use as a pusher in the blender, and the thick oak spoon I only use for overnight bread dough. I do have a square one. I may have used it once or twice. If you give me a few hours I might even be able to find it. We have a wooden spoon that has worn flat on the bottom after decades of use - best of both worlds! What if you're mixing in a bowl? A flat bottom won't help you there. Oh pooh on Mr. Ruhlman, methinks he doth protest too much about what we should be using to stir the stew! My goodness, wooden spoons & an old wooden spurtle are my most used utensils. I have wooden spoons in all sizes, from extra long, to petite, with the petite being the best for creaming small amounts of flavoured butters. Besides being perfect for cooking, my extra long wooden spoon is perfect for closing a hard to reach window over my kitchen sink! While I want to like Ruhlman, and have enjoyed much of his writing, there is something about him that smacks of the schoolyard bully, a sort of aggressive smarter-than-thou style that I find off-putting. And he's not even from Upstate New York, so how much could he really know? I think some of the things Michael Ruhlman has to say would be better off unsaid. I completely agree. I use both round and flat in my kitchen. Wooden spoons bring back memories of childhood. I wish I had realized what treasures her kitchen drawers held back when my mom died to keep her wooden spoons. I am so lucky that my mother-in-law has said she will leave the kitchen utensils she's had for over 50 years now to me. I may not use them, but I will display them with great pride and place of honour in my kitchen. Imagine all those years of love! For me silicone square spoon with slightly roundish corners is the only way to go. I really dislike the taste of wood and I find that a squarish spoon works much better. But this is for me. Then others can use whatever they prefer. that was a unique video blog. wood in spain is forbidden in profesional kitchens. round shape is not of course, and we love that shape to stir and to taste. i didnt understand why "you dont want to taste with the spoon". I bought some spoons that are shaped just like wooden stoons but they are melamine spoons. I have heard that wooden spoons harbor jerms that do not wash off. 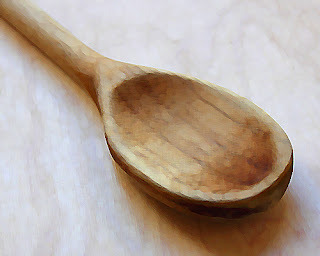 When you taste food with your big wooden spoon, I hope you do not stick the spoon back into the food to stir it. "I LOVE using my big, round, wooden spoon with the thick, long handle." Easily the best comment posted so far, hands down. I have both kinds and use each when appropriate. It's called, oddly enough, "appropriate technology." @Rachel said: "We have a wooden spoon that has worn flat on the bottom after decades of use - best of both worlds!" My sentiments, exactly. One of my favorite wooden spoons has a worn flat, at exactly the right angle for me (because it was worn at the angle that I hold the spoon when scraping). @Connie T. said: "When you taste food with your big wooden spoon, I hope you do not stick the spoon back into the food to stir it." That depends. If what I'm stirring is boiling, sure why not? Not only do I sip from the edge so only my dry lips might only brush the spoon, as soon as I put the spoon back into the boiling liquid any germs get boiled into non-existence. For cooler things, I pour from my stirring spoon into my tasting spoon. Well, I do a lot more things in the kitchen than scraping off the bottom of a pan. And at least one wooden spoon is a must for me specially with non stick pot and pans... Yes it may not be good for scraping, but really good for stirring soups, stews, stirring pasta in its cooking water and the curries always (I am from India). Also I have a whole set of wooden spoons that are kept in the drawer only for one purpose... stirring during wine making. Back in India wines are not readily available to buy and so if we want we (specially Christian families) make it ourselves, with Grapes, Pineapple, Gooseberry, Raisins, Beetroots and a lot more. I didn't know why but the elders say to use a wooden spoon for stirring. I love my wooden spoons. When I moved out of my mom's I bought my own set of wooden spoons, which did include a square spoon. The only time I use the square one is when the round one is dirty. It is just habit to go for the round one after all of these years. I have to think too much when using the square one since I am not used to the feel of it and I miss the corners of the pan with it. Huh, this seems to be funnily cultural. My grandmother had some kinds of wooden spatula thingies for cooking and so do I. They are flat at the bottom for scraping but with rounded corners so that you can easily scrape the edge of the pan as well. The sides are perfect for scraping the side of a pot. It's flat so I can flip palatschinken and schnitzel easily. It's the perfect all around tool for me, I have wooden spoons as well but I only use them as a last resort when I forgot to do the dishes. Is there any particular brands or products that you recommend? What are the things that you use?